The case fits snug, and feels good in the hand. Extra padding on the corners… for under $10 these are super legit. The orange is almost pink/peach, so heads up there — but other than that, great cases! 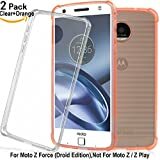 1, This case is specially designed for Moto Z Force Droid. 2, Precise cutouts for speaker, camera, other ports and controls. Full access to all features without removing the case. 3, Made of premium, smooth, tough, flexible and eco-friendly TPU with transparent clear body, the case retains all the original color and design of Moto Z Force. 4, TPU is shock absorbent, shatterproof, and scratch resistant. It does not have the plastic odor and very easy to clean. 5, The soft coating and rounded edges make for comfortable grip, and flexible to place or remove easily. 6, Ultra slim and lightweight case, adds minimal bulk to your Moto Z Force, you will barely feel it there. 7, Offer full protection for the back panel, edges and corners of Moto Z Force. 8, Advanced Shock Absorption Technology: Air Cushioned 4 Corners.